GolfBaja.com Featured on Baja Insider: Golfers Don't Just Visit the Baja, They Fall in Love With It! Mexico’s Baja California Peninsula is a stunning vacation paradise offering some of the world’s best golf and beaches. From the California border to the tip of Land's End at Cabo San Lucas, visitors will find crystal-clear azure waters, warm sugar-white sands, and refreshing ocean breezes. Cabo San Lucas is the center of most tourist activity, and has become one of the most sought after golf destinations in the world. Its small downtown area has dozens of restaurants, bars, and specialty boutiques to keep any vacationer satisfied. In nearby San José del Cabo, the pace is slower, and the city center, with its adobe buildings and dusty streets, is more authentically Mexican. The corridor that connects these two cities is laced with elegant resorts, all featuring stunning stretches of sun-drenched beaches. 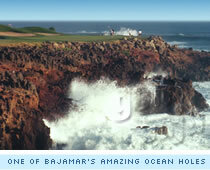 Baja golf courses are distinctive and characterized by stunning geography. Oceanside holes, lush green fairways, and inspiring desert terrain create dramatic views that are as pleasing as they are detrimental to your game. Some of golf’s top architects have designed a number of these masterpiece layouts, including Jack Nicklaus, Robert Trent Jones, Jr. and Pete Dye. Wherever you choose to tee off in the Baja, you are guaranteed a memorable and challenging round! Learn more about the Baja's undisputed premier Pacific paradise. San José del Cabo, the Corridor and Cabo San Lucas await! The Tijuana Country Club offers the only golf course in a city of almost 2 million. Despite being surounded by the city, this Alister MacKenzie design is very pretty and well-groomed and represents a good Baja golf value. Cultural immersion, fine dining, spa services and beachfront relaxation at The Villa Group Resorts in Cabo San Lucas. This normally quiet course is in the first stages of a major overhaul. Don't come expecting Palmilla; but do anticipate an enjoyable round of golf in a peaceful, pretty setting. Its reputation as a “little Pebble Beach” creates high expectations that are well-deserved, and while Bajamar is worthy, it isn't world class... yet. However, a golf course doesn't have to be world-class to provide golfers with inspiration, and Bajamar scores high for its strikingly beautiful landscape and casual, slow-play atmosphere. Back in the 1950s, the Baja was exposed as one of the greatest sea-fishing grounds known of. A decade later, several exclusive lodges were populating Cabo San Lucas, San José del Cabo, and the 20-mile corridor that connects them. 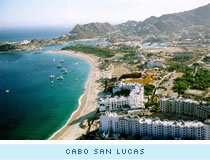 This area is collectively known as Los Cabos and represents the most popular tourist zone in the Baja. Since then, tourism has advanced at a frenzied pace, and there are now dozens of deluxe hotels, resorts, and championship golf courses working their way into Baja's desert landscape. However, the Mexican government has made sure that this growth has been handled tastefully and the area is still abundant in what was the original lure: clear blue waters plentiful with fish, long beautiful beaches, and hidden rocky coves. We'd like to help you plan that unforgettable Baja golf vacation. Our Baja Golf & Travel Specialists are ready to assist you in designing a custom golf package featuring the incredible golf courses in Cabo San Lucas, San Felipe, or elsewhere in Baja California. We can help tailor your course selections and accommodations to your skill level and desire. In addition to Cabo tee times and hotel or resort lodging, we can also arrange ground transportation for you at competitive rates. 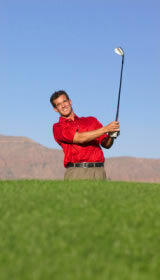 We look forward to helping you tee it up! © GolfBaja.com and LeadsLogic, 2004-2019. Website by National Golf Marketing.